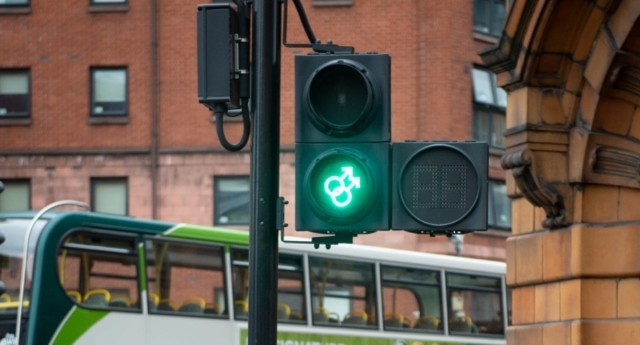 New pedestrian signals in Manchester will catch the eyes of LGBT+ people visiting the city for its annual Pride festival this weekend. Four specially designed pedestrian crossing signals have been introduced to parts of the city to mark Pride, and represent lesbian, gay, heterosexual and transgender relationships using gender symbols. The initiative, which was inspired by similar efforts for Bournemouth Pride and London Pride in 2016, will replace 34 of the traditional green man symbols for the whole bank holiday weekend. “These diversity images on traffic lights do this in a fun and engaging way,” he added. Juergen Maier, CEO of Siemens UK, who made the new lights, said the company was proud to show their support for the festival. Siemens will also be sponsoring a well-being community café at LGBT Foundation in the Gay Village over the course of Pride. The aim of the café is to provide a space for people to relax and meet other people, as well as reducing social isolation. Manchester Pride’s four day event, the Big Weekend, will kick off on Friday with Rita Ora, Jake Shears, Sigala and Alexandra Burke taking to the stage. It looks to be the last year that Manchester Pride will take place in the city’s iconic Canal Street location, due to property development. Organisers confirmed to PinkNews earlier this month that due to “significant development in the area… there won’t be the space next year” to host the event in the same area.